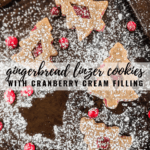 The warm spice flavors of these soft gingerbread cookies pair perfectly with the tart, slightly sweet cranberry cream filling. 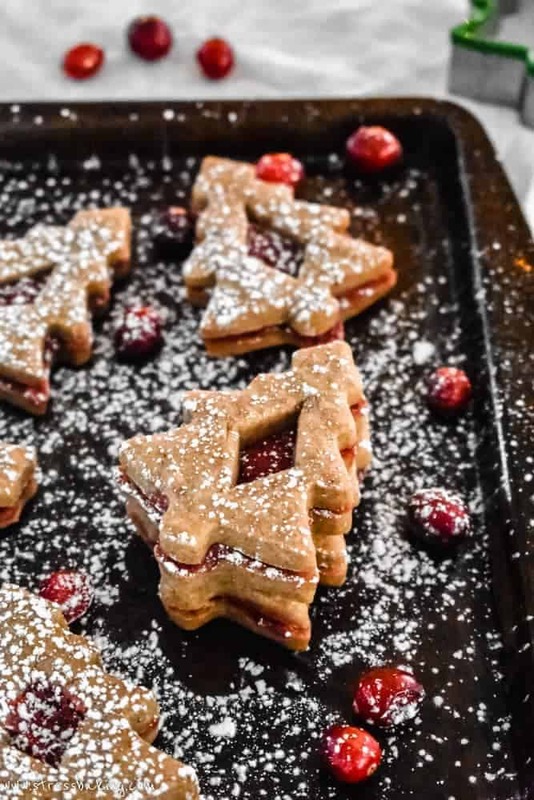 Top them with a delicate dusting of powdered sugar for a beautiful and festive holiday linzer cookie! Happy December, friends! This is THE month. You’re cozying up with a million layers and blanket scarves, you’re drinking hot chocolate, you’re justifying the 26 different cookies you ate today by saying, “It’s the holidays!”. Apologies, but I’m about to add another cookie to your list. I’d set out to make linzer cookies last year, and I made one batch that did not turn out well and I just kinda gave up. I think it was also a night where I’d had a rough day at work, I’d had a string of failed recipe attempts, and I was probably strung out from not sleeping because winter nor’easters in the old house were loud and terrifying because it was on stilts and swayed back and forth. FTR, I don’t miss that. 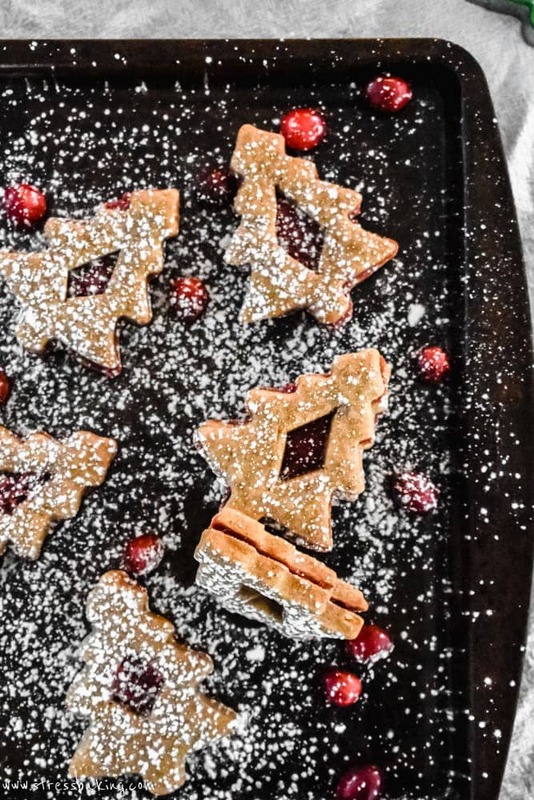 So I decided to try again this year, but the idea of a standard linzer cookie just… bored me. A buttery cookie stuffed with jam. … meh. I just felt very meh. And I don’t want to share recipes with you that make me shrug and want to go to bed. I was doing SEO research for what people are searching for in the month of December, and “gingerbread” was a major, high ranking keyword. I’m not going to sugarcoat the fact that I make a lot of these recipes based on what I think is going to rank well and show up in Google and Pinterest searches, because girl’s gotta make a living. But I will sugarcoat these cookies. I knew I wanted to make gingerbread something and since I still had the linzer cookie bug, I figured I could give making some gingerbread linzer cookies a shot. I was torn on what kind of filling they should have. I was going to do a raspberry jam, but I didn’t have raspberries. 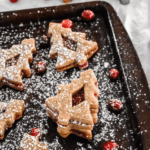 Then I thought of doing just a whipped cream filling, but that’s… not a linzer cookie filling. That’s just me finding yet another way to put mascarpone whipped cream in something because I can’tstopwon’tstop. Finally, I decided on cranberries. 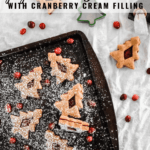 I initially made a simple cranberry jam that was basically just cranberry sauce, but that seemed too much like a “hey, take your leftover cranberry sauce from Thanksgiving and throw them in these cookies” and that felt weird. Instead, I added a little mascarpone (because seriously, I can’t stop) to make it more of a cranberry cream and I loved it. Added bonus: any leftover cream tastes fricking fantastic on toast, FYI. Oh, P.S. 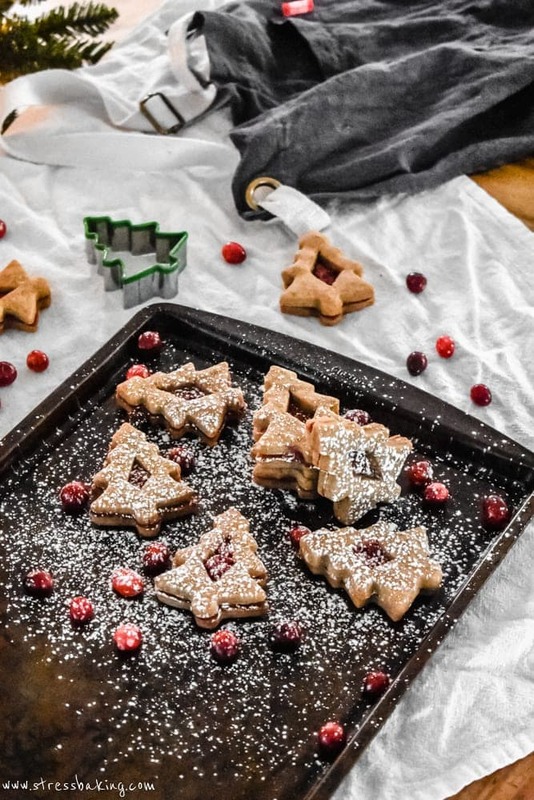 : my tree cookie cutters came to me as part of a set and I can’t find it anywhere online anymore, but these nested tree cookie cutters would be great because then you’d have all sorts of different sizes! I vote that we all make these for Santa, because he’s probably bored with the same ol’ same ol’. And while you’re at it, leave him a glass of cashew milk because maybe he needs a break from all the dairy and will find it refreshing. But seriously, don’t leave any kind of milk out for him. Room temperature milk that might be filled with cat hair or dust? Hard pass. Unless you put it in a nice sippy cup and put it on ice for him – that would be lovely and thoughtful of you. Need more gingerbread in your life? Chewy Ginger Molasses Cookies because I don’t believe in gingersnaps. The North Pole Cocktail by Half Baked Harvest – I don’t even have words for this one. 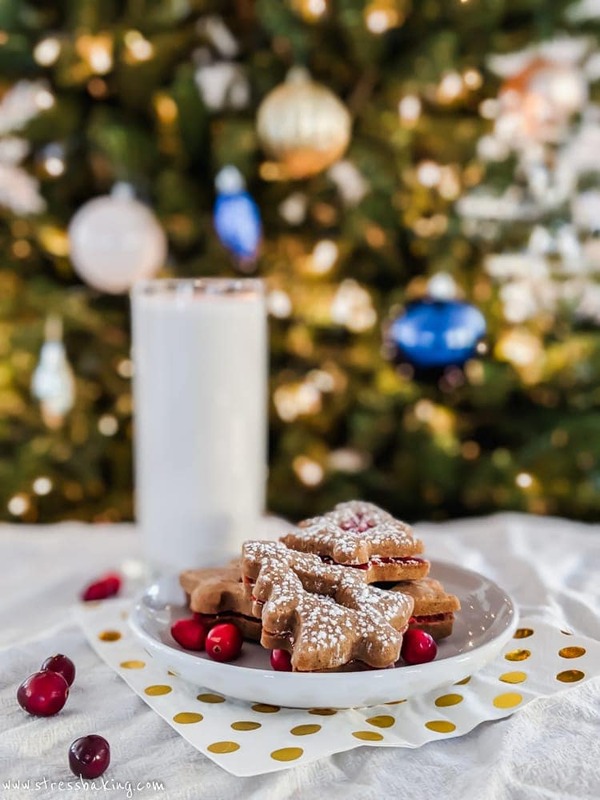 Paleo Gingerbread Bars because you shouldn’t have to miss out on gingerbread if you have dietary restrictions. Gingerbread Ice Cream made with the aforementioned gingerbread bars! SUPER fluffy gingerbread donuts from Hunger Thirst Play because I need more fluffiness in my life. And gingerbread cashew coffee. And gingerbread motivation muffins. She’s got even more on her site, just go look at them because otherwise we’ll be here all day. Gingerbread hot cocoa from Kim’s Cravings because omg go look at the pictures. Spicy gingerbread cake with orange mascarpone cream from Bowl of Delicious because she knows the way to my mascarpone-loving heart. The warm spice flavors of these soft gingerbread cookies pair perfectly with the tart, slightly sweet cranberry cream filling. 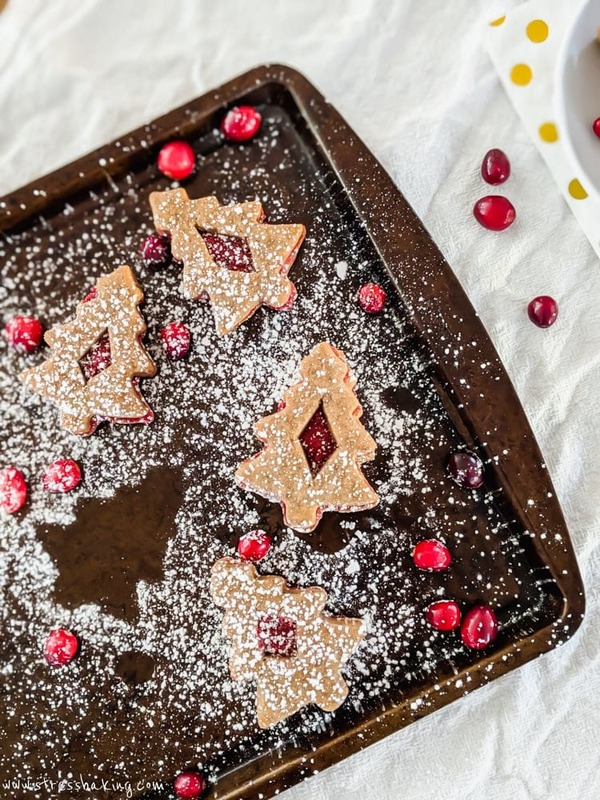 Top them with a delicate dusting of powdered sugar for a beautiful and festive holiday cookie! In a small pot, combine cranberries, sugar and water, and bring to a boil over medium heat. Reduce heat to low, and allow to cook for about 5 minutes or until it’s thickened with a jam-like consistency. Stir frequently to ensure it doesn’t burn or stick to the bottom of the pot. Remove from heat, stir in mascarpone/cream cheese and vanilla extract and set aside to cool. In a stand mixer, beat butter, brown sugar and vanilla on high speed until combined. In a separate medium bowl, whisk together flour, ginger, cinnamon, nutmeg, cloves and salt. Add dry mixture to the mixer with butter mixture and beat on medium speed until completely combined. It will go through different stages of seeming far too dry, then a very small crumb, then a larger crumb, and then it will form into a dough. Just give it time! Use your hands to form the dough into a ball, then wrap in plastic wrap and refrigerate for at least an hour. Preheat oven to 350°F and line two large baking sheets nonstick silicon mats or parchment paper and set aside. Remove dough from fridge and let it warm up a bit on the counter for about 15 minutes before you start working with it to avoid it cracking. On a well-floured surface, roll out your dough with a rolling pin to about 1/4″ thickness. 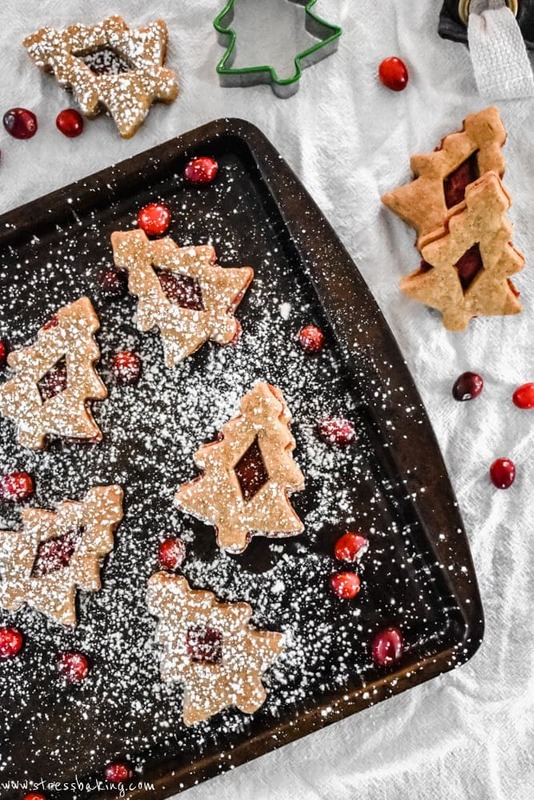 Use your cookie cutter of choice to cut out cookies and place half of them on baking sheets about 1″ apart. 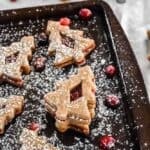 You’ll want to cut out the centers of the remaining half of the cookies with a smaller cookie cutter of choice, or you can cut out shapes with a pairing knife (like I did for the ones in the pictures). Bake for for 8 to 10 minutes, or until the cookies are set, but not yet turned golden. They should still feel a bit soft, you don’t want to overbake them. Let cool on baking sheets for 15 minutes before moving to wire racks to cool completely. 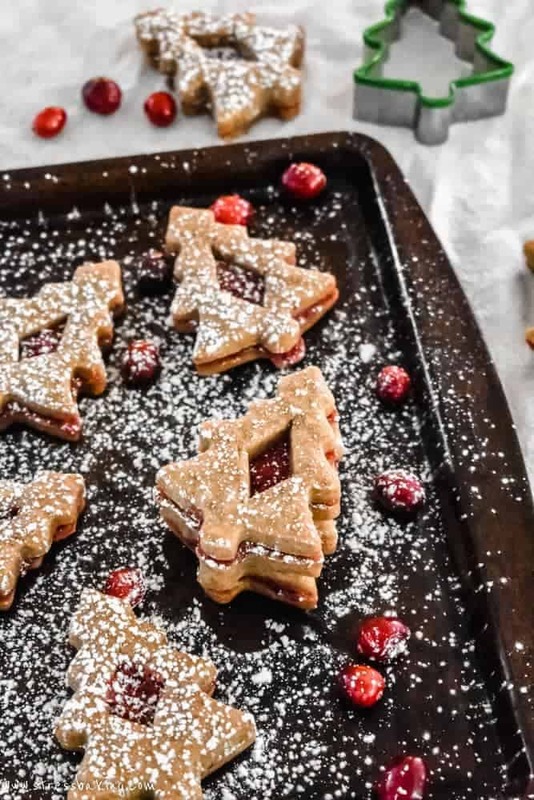 Use a mesh sieve or flour sifter to dust the cookies with the cutouts with powdered sugar. 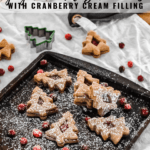 Place about a teaspoon (depending on the size of your cookies, you may want more) of cranberry cream on top of the uncut cookies and top each with a cut cookie. Serve and enjoy! Store in an airtight container in the fridge or at room temperature (as long as the room stays on the cooler side) for up to 4 days. They will start to soak up moisture from the cream over time so you should plan to consume them within a couple days of making them. I love these! 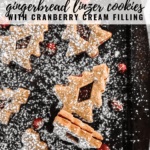 The gingerbread/cranberry combo is amazing and they’re so pretty too! I’m pretty sure Santa would be very excited to see these left out for him.